Facebook Pages: Just How Hard Is It Now? This is not the usual post for this blog but I just wanted to share a few thoughts about my page admin experience. Other SME Facebook admins may agree with what I am saying. Bettertax has had a facebook page for 3 years now. Back in the day there was certainly more access to engage with people who could be considered as interested in what the page had to say. As an SME, advertising budgets are restricted, certainly in the beginning and working hard using social media platforms was a fantastic way to promote what we do to new and existing clients. It’s been brilliant for interacting with clients, liaising with them and keeping them up to date. The Bettertax Facebook page would certainly not be classed as spammy and probably 90% of posts are not of a direct marketing nature. The page set out to be fun, communicative, accessable, entertaining, informative – we believe that’s how we have kept it. 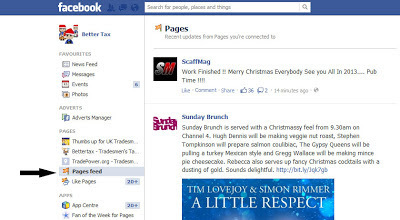 What Facebook have done is introduced the “Pages Feed” feature that as a facebook user, you can select to look at. All the pages you have liked will have their posts appear in that feed. That was news to me too! We’ve worked very hard to keep up with all the new trends that Facebook have thrown at us over the time but unfortunately this latest one where Facebook have allegedly reduced how many users see page posts in the news feed to get pages to pay to reach their fans, has us quite beat. There are many bloggers out there refuting that if you’re page/ product offers great quality posts then this new “algorithm” won’t affect you. Unfortunately, not all pages are Coca-cola or Nike with millions of followers. Looking at promoted posts (not sure how that stops newsfeeds being spammed!! ), it can be a costly practise. For example, the cost of a promoted post on the Bettertax page is £4, but then we have a modest number of followers (all quality people though :)). Certainly if the page post has no preview or picture, the reach is considerably more. I argued this with another blogger but looking at my own stats I know it to be true. The conclusion would therefore be to post plain text onto the Bettertax Facebook page. It leads to a far more boring looking page that will attract less new “likes” and probably less interaction from the few that even see it! If you already “like” our page, why not click the like, share or comment (assuming you like what you see!). It helps us greatly and also, if the post entertained or informed you, chances are, it may do the same for your friends. Luckily we don’t have to rely on our Facebook page as a means of “advertising” and engagement. We are accessable on all the other platforms too, as seen below! Anyway, I’ll get back to what Bettertax do best now – tradesman tax refunds!! Home » Blog » Facebook Pages: Just How Hard Is It Now?